fone pro (previously called Facebook Messenger) from CrispApp is an iPhone app that lets you chat with and call your Facebook friends for free. Good news is it actually works. Bad news, if any is that there is no video support and the app is not free. It’s basically like Viber with Facebook integration. Using the app is pretty self explanatory, you just authenticate and allow fone pro to access your Facebook profile and it loads your Facebook chat list. 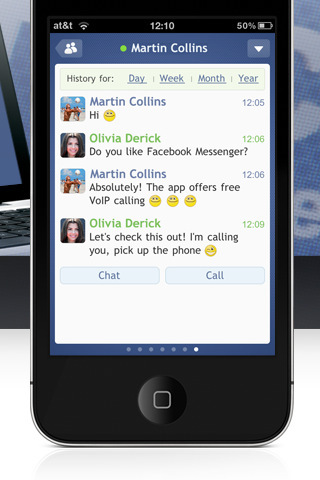 Tap on any friend to either call them or send them a message via Facebook chat. When you call someone via the app, it starts dialing right away on your end, showing you their Facebook picture and making a basic dialing noise. 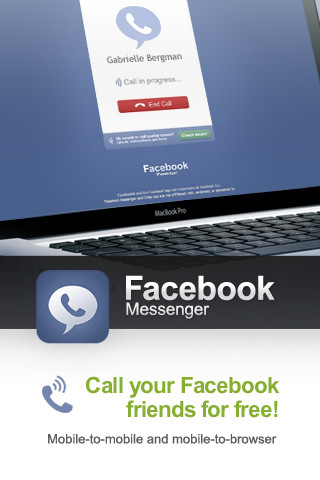 Calls between iPhone and Computer: You can call out from the fone pro iPhone app to any Facebook friend who’s online. They get a chat message with a web link to http://crispapp.com/ where a flash app connects the call. Once you receive a call you have to confirm and allow flash to access your computer’s microphone and from there you can talk back to your friend on their iPhone. Calls between iPhone and iPhone: Simply pick any friend and from the drop down menu choose call. Their iPhone will get the push notification about the incoming call and off you go. The fone pro app uses VoIP for calls, so be sure you’re on an unlimited data plan or at least monitor your data usage if you’re calling over 3G and not WiFi. You can send photos from your iPhone to your Facebook friends using this app as well. fone pro will upload your pic to CrispApp web servers and then forward your friend a link to that page. You can view chat history with friends for day/week/month/year which is stored on the cloud, although I was not able to get this feature to work. There is also a built in web browser. The user interface of the app is super clean and intuitive. There are multiple windows, one for your friends list, another for your chats. The app pulls in your custom friends lists from Facebook, and you can search for people by nickname. There’s a bug with searching however. If you try to find someone who doesn’t exists you will get a message saying “No results” which will always remain on top of your friends list. The only way to get rid of that text is to force quit the app and restart. Settings and Options: You can change your online status to offline or logout. Push settings include Expiry notification, and Message preview. You can set a timeout for the app between 1 hour and 7 days, and even type an autoreply message to be sent out. You can hide/show offline contacts and also pick whether you want to see your friends in groups or not. Sounds can be turned on/off for new messages, active chats, online contacts, and incoming calls. Finally there’s a prevent sleeping toggle which will keep the app active behind the scenes. Overall, fone pro is a wonderful app for keeping in touch with Facebook friends on the go, which combines text and voice calling into one. Its performance is nearly perfect. Taking advantage of your unlimited data plan to speak with Facebook friends for free is a big selling point, especially if they live overseas. Unfortunately the app itself does cost $2.99 which will hinder lots of casual app users from bothering to pick it up. AppSafari review of fone pro was written by Joe Seifi on February 22nd, 2011 and categorized under App Store, Chat, Featured, Phone, Social, VOIP. Page viewed 7062 times, 1 so far today. Need help on using these apps? Please read the Help Page.